Jerheme Urban (born November 26, 1980 in Victoria, Texas) is an American football wide receiver for the Kansas City Chiefs of the National Football League. He was originally signed as an undrafted free agent from Trinity University by the Seattle Seahawks and served as a reserve wide receiver during his years there. His 2005 season was cut short by a re-aggravated left foot stress fracture, and he was not re-signed. He was signed by the Cowboys in 2006 and joined their practice squad, and was cut from the team's active roster before the start of the 2007 season. The Arizona Cardinals signed him to their active roster from the waiver wire on September 2, 2007. He caught a then career-high 22 passes in 2007, including two touchdowns. 2008 saw Urban set new career marks with 34 catches for 448 yards and four touchdowns. He also contributed 11 tackles on special teams and completed his first pass in the NFL. 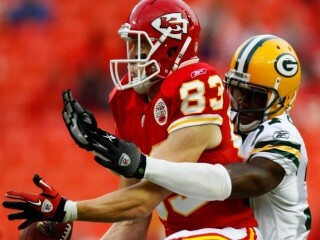 He was then signed from free agency to the Chiefs roster on March 11, 2010. Urban is considered by many to be the ultimate team player. Seattle Post-Intelligencer sportswriter Jim Moore wrote of Urban's tenure with the Seahawks that he "...wasn't a good soldier, he was a great one." Quarterback Matt Hasselbeck said of Urban, "Whatever the definition of a Seahawk is, he's it." ESPN's Bill Williamson wrote of Urban that "This is an under-the-radar player who always seems to make coaches fall in love with him." Pro Career: Speedy sixth-year wideout signed with Kansas City on March 11th ... Is reunited in Kansas City with Head Coach Todd Haley who served as his offensive coordinator in Arizona ... Spent time with Arizona (2007-09) and Seattle (2004-05) prior to joining the Chiefs ... Also enjoyed practice squad stints with Dallas (2006) and Seattle (2003) ... Provides another reliable receiving target for the club, and also has the ability to contribute on special teams ... Has played in 47 career regular season games (six starts) ... Has caught 87 passes for 1,231 yards (14.1 avg.) with seven TDs and completed one pass for 18 yards ... Also has 13 special teams tackles and one kickoff return ... Has played in five postseason games (two starts), tallying 24 receptions for 407 yards (17.0 avg.) with one TD and one special teams tackle. Transactions: Signed with Kansas City (3/11/10) ... Re-signed with Arizona (3/27/08) ... Claimed off waivers by Arizona from Dallas (9/2/07) ... Waived by Dallas (9/1/07) ... Signed with Dallas (1/10/07) ... Added to Dallas’ practice squad (10/19/06) ... Signed by Seattle (10/4/05) ... Released by Seattle (9/14/05) ... Signed with Seattle (2/8/05) ... Signed with Seattle (11/5/04) ... Released by Seattle (9/9/04) ... Signed by Seattle (12/26/03) ... Added to Seattle’s practice squad (9/1/03) ... Released by Seattle (8/31/03) ... Originally entered the NFL as a rookie free agent with Seattle (5/1/03). Arizona (2007-09): Played in 36 games (four starts) ... Compiled 74 catches for 963 yards (13.0 avg.) with six TDs ... Also completed one pass for 18 yards and returned one kickoff for one yard ... Added 13 special teams tackles ... Saw action in six postseason contests ... Tallied nine receptions for 95 yards (10.6 avg.) and one special teams tackle. 2009: Played in 10 games and was active, but did not play in one contest ... Was inactive for five contests ... Caught 18 passes for 186 yards (10.3 avg.) and added two special teams tackles ... Recorded five receptions for 74 yards vs. San Francisco (9/13) ... Posted four receptions for 41 yards vs. Houston (10/11) ... Was active, but did not play vs. Seattle (11/15) ... Was inactive at St. Louis (11/22), at Tennessee (11/29), vs. Minnesota (12/6), at San Francisco (12/14) and at Detroit (12/20) ... Played in two postseason games, registering three catches for 47 yards (15.7 avg.) ... Had one reception for 13 yards in an NFC Wild Card Game vs. Green Bay (1/10/10) ... Caught two passes for 34 yards in an NFL Divisional Playoff Game at New Orleans (1/16/10). 2008: Appeared in all 16 games (two starts), catching a career-high 34 passes for 448 yards (13.2 avg.) with four TDs ... Also completed one pass for 18 yards and had a kickoff return for one yard ... Added nine special teams tackles ... Recorded five receptions for 50 yards with a TD at the N.Y. Jets (9/28) ... Amassed three catches for 10 yards vs. Buffalo (10/5) ... Totaled four catches for 51 yards at Carolina (10/26) ... Had a career-long 56-yard TD reception at St. Louis (11/2) ... Caught four passes for 38 yards vs. San Francisco (11/10) ... Posted five receptions for 69 yards vs. the N.Y. Giants (11/23) ... Compiled three catches for 82 yards with a 50-yard TD vs. Minnesota (12/14) ... Totaled four catches for 43 yards with a TD vs. Seattle (12/28) ... Played in four postseason contests, registering six catches for 48 yards (8.0 avg.) and one special teams tackle ... Tallied two receptions for seven yards in an NFC Wild Card Game vs. Atlanta (1/3/09) ... Posted two catches for five yards in an NFC Divisional Playoff Game at Carolina (1/10/09) ... Caught one pass for 18 yards in the NFC Championship Game vs. Philadelphia (1/18/09) and in Super Bowl XLIII vs. Pittsburgh (2/1/09). 2007: Played in 10 games (two starts) and was inactive for six contests ... Caught 22 passes for 329 yards (15.0 avg.) with two TDs and also had two special teams tackles ... Claimed off waivers by Arizona from Dallas on September 2nd ... Was inactive at San Francisco (9/10), vs. Seattle (9/16) and at Baltimore (9/23) ... Produced five receptions for 53 yards with a TD vs. Pittsburgh (9/30) ... Totaled three catches for 28 yards at St. Louis (10/7) ... Compiled three receptions for 41 yards at Washington (10/21) ... Had a 12-yard TD catch at Tampa Bay (11/4) ... Was inactive at Cincinnati (11/18) ... Was inactive with a heel injury vs. San Francisco (11/25) and vs. Cleveland (12/2) ... Tallied six receptions for 123 yards with a TD at Seattle (12/9), his first career 100-yard receiving game ... Posted two receptions for 17 yards vs. Atlanta (12/23). Seattle (2003-05): Played in 10 games (two starts) ... Caught 13 passes for 268 yards (20.6 avg.) with one TD ... Was also inactive for two postseason contests. 2005: Saw duty in four contests (one start) and was inactive for one game ... Tallied seven receptions for 151 yards (21.6 avg.) ... Was inactive at Jacksonville (9/11) ... Was released on September 14th and re-signed on October 4th ... Caught a 11-yard pass at St. Louis (10/9) ... Posted two receptions for 37 yards vs. Houston (10/16) ... Recorded three catches for 57 yards vs. Dallas (10/23) ... Had one reception for 46 yards at Arizona (11/6) ... Was placed on injured reserve with a foot injury on November 9th. 2004: Played in six games (one start) and was inactive for two contests ...Caught six passes for 117 yards (19.5 avg.) with one TD ... Spent the first seven games on the practice squad and was signed to the 53-man roster on November 5th ... Caught two passes for 50 yards in his first career start at San Francisco (11/7) ... Posted two catches for 31 yards vs. Buffalo (11/28) ... Registered two receptions for 36 yards with a 19-yard TD vs. Dallas (12/6) ... Was inactive with a foot injury vs. Arizona (12/26) and at Atlanta (1/2/05) ... Was inactive with a foot injury in an NFC Wild Card Game vs. St. Louis (1/8/05). 2003: Was inactive for one game ... Spent the first 15 games on the practice squad and was promoted to the 53-man roster on December 26th ... Was inactive at San Francisco (12/27) and in an NFC Wild Card Game at Green Bay (1/4/04). College: Caught a school-record 40 career TDs at NCAA Division III Trinity University ... Led the club with 75 receptions for 1,274 yards with a school-record 19 TDs as a senior in 2002 ... Named first-team by d3football.com and second-team by Football Gazette ... Is the only athlete in the Southern Collegiate Athletic Conference to earn the Male Track and Field Athlete of the Year four consecutive seasons ... Holds school or conference records in the 100-meter dash, 400-meter dash, the 400-meter hurdles, long jump, triple jump and the 4x400 relay ... Qualified for the national championships in those six events as well as the javelin all four years ... Graduated from Trinity with a degree in Social Studies Composite. • A second-team District 29 5A selection as a quarterback his junior and senior seasons at Stroman High School in Stroman, Texas. • Earned first-team All-State Academic honors as a senior. • Also ran track and named the District 29 5A Newcomer of the Year in soccer. • Serves as an assistant track coach at Trinity University, focusing on the triple jump, long jump and javelin. • Grew up working on a cattle ranch. • Full name: Jerheme Wayne Urban. • Married, wife Emily with a daughter, Liesl born in March of 2010. His wife ran track at Trinity. View the full website biography of Jerheme Urban.